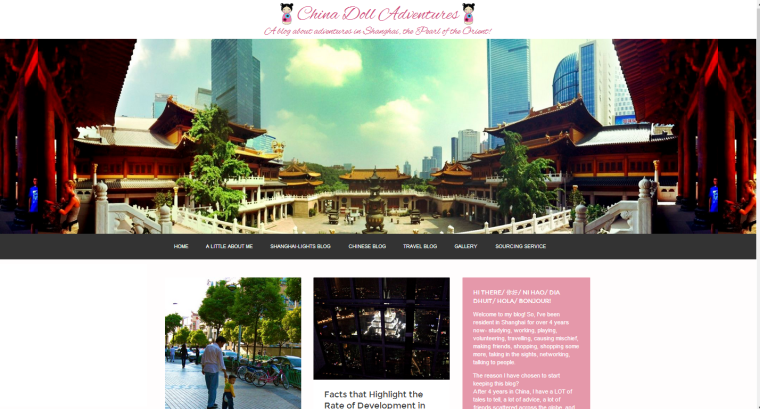 Don't go to Shanghai until you read ChinaDollAdventures.com first! When I first visited Shanghai back in 2009 I was blown away. Making sense of this city can be a daunting process. There's so much to see and do that at first it can seem like an overwhelming task. Luckily while I was in Shanghai with my family we were fortunate to have our own personal tour guide, my sister-in-law, Stephanie FitzGerald-Smith. I'd have to admit that without Stephanie we would have been a bit lost. Having someone who can haggle with the locals, take us to the right markets and recommend where to eat was worth its weight gold. So what do you do if you don't have a Stephanie? Well, as it turns out, now everyone can have a Stephanie! She's started writing about her adventures in Shanghai on ChinaDollAdventures.com. The site is just starting out but it already has some fantastic posts on where to go to grab a bargain, the best apps to have on your phone to help you get around and even some handy Chinese phrases to help get your own Shanghai adventure off to a great start. Stephanie has been living in Shanghai for nearly 5yrs now and knows exactly where to go and who to talk to so that you can have the best quality goods at amazing prices. As well as writting about her time in Shanghai, Stephanie is also starting up a Shanghai Sourcing Service for individuals and businesses. Do you want someone to find you the softest silks, cheap designer clothing or even the latest tech directly from Shanghai? Stephanie can help track all these and more down for you or your business. She has been living in Shanghai for nearly 5yrs now and knows exactly where to go and who to talk to so that you can have the best quality goods at amazing prices. The site also has some stunning photos on what daily life is like in one of the worlds fastest growing cities. I particularly like her Only in China gallary where you get a fantastic sense of how mad and crazy a city shanghai can really be! So what are you waiting for? Go check out the blog now and book that Shanghai holiday you've always promised yourself!